When you first suspect you may have TMJ disorder, the first thing you will often read or your doctor will tell you is that there are self-care techniques that you can do at home to help your jaw pain. Moist heat – many TMJ patients find heat very helpful to relieve pain & muscle tension and/or spasm. Ice therapy – patients who have just had surgery or are experiencing inflammation often like ice. 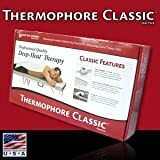 We’ve tried MANY heating pads, from small electric ones you slide the moist sponge into to provide moist heat (verdict: affordable and easy to find) to more sophisticated models that draw humidity from the air and have digital dials to let you set the exact temperature you’re looking for (verdict: amazing, but can be more expensive). AWS.InvalidParameterValue: B000P7NV36 is not a valid value for ItemId. Please change this value and retry your request. 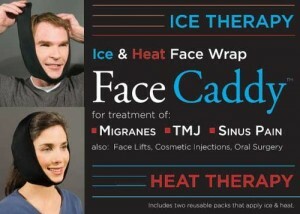 Also, note that we have a $5 discount code for Face Caddy if you enter TMJ as your coupon code at checkout! 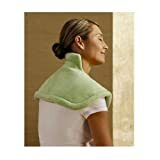 Do you have a heating pad you have tried that you would like to share with us?